The first short track race of the season was last night at a new, old venue. No longer were we racing on the taint pounding, uneven hard pack of Darree fields, we were racing on a slightly better course, Big Run. The course was similar to the cross races of years past, just a little shorter, no road section and the course didn't cross the road (twice) to get the bonus grassy section. Out of the gate, it was The Taylor, The Kruse Missile Show! Setting a blistering pace, he slowly, I mean quickly, gained time on everyone. He lapped everyone in the Single Speed field and he probably lapped most of everyone else in the race as well. I know the Single Speed category is an "Open" field, but come on, you are simply doing nobody justice. To even put more salt in everyone's racing wounds, Taylor toed the line again for the Cat 1/2/3 mens race. This obviously was more of his race as he battled up front. He was in 2nd place for a good portion of the race until Doug Caraway turned on the afterburners and caught up to the Kruse Missile. They battled on for the remainder of the race and Doug just nipped Taylor at the finish line. The winner? The Teenage Dream, who also almost lapped the entire field. Seems like those boys down in Southeast Ohio have been racking up the wins and podiums! 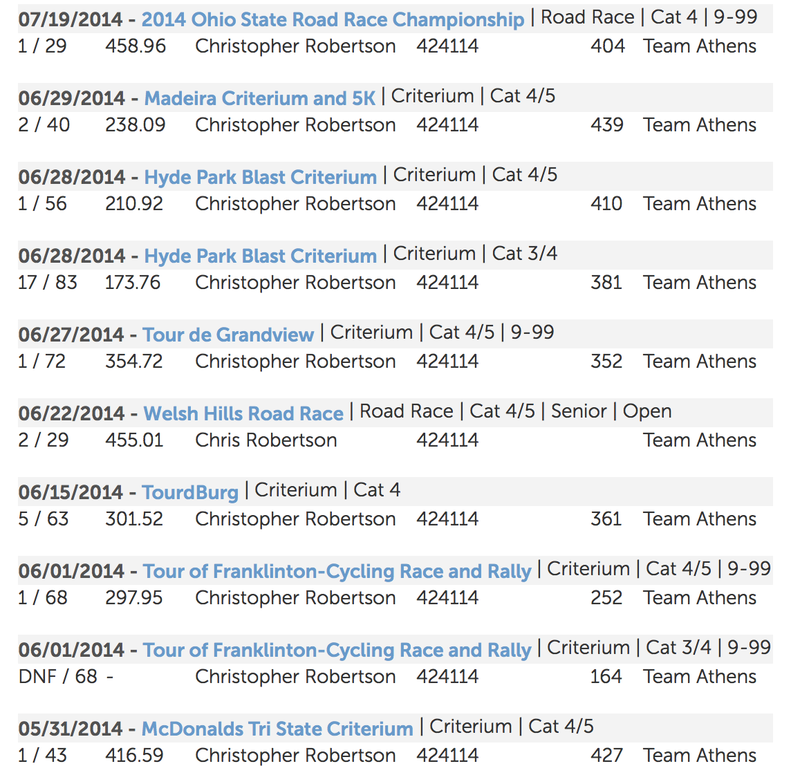 This weekend at the State road race, those Athens boys went 1-2, and also put 5 in the top 10 in the Cat 4 race. Are they running an institutionalized sandbagging regime? Might be time for a few of those guys to upgrade! Speaking of upgrading, the winner of the race, Chris, has been on my radar for quite some time. A quick check of his race history shows a lot of 1's and single digit numbers in the placing category. Don't know where he came out of, but he's certainly one of the hottest Cat 4 racers in the state, and hopefully soon to be Cat 3. Come on, you call yourself out on Face Space? You don't choose the terms on when you get or not get called out on this glorious blog! This Blog is a Public Service! I hear and read many things that this blog is bad for the sport, the writer should disappear and die, etc. Another thing is people trying to figure out the author of the blog. I have to say I have to disappoint and say that this blog is a collective. It is a collective of everyone's voice, everyone's frustrations, everyone's blood sweat and tears. This blog points the finger at people that fingers need to be pointed at, calling out those who need to be called out and most importantly, not sugar coating anything. 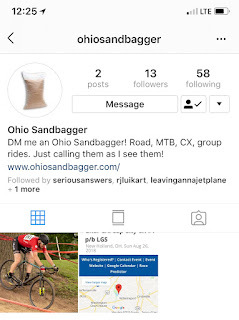 So upset you made Ohio Sandbagger? Well there are certainly plenty of people upset at you. So do the right thing and UPGRADE! Because we won't stop, we won't stop calling all of you out. Maybe even Corey Green will start reading this blog and take some notes on who he needs to auto upgrade. 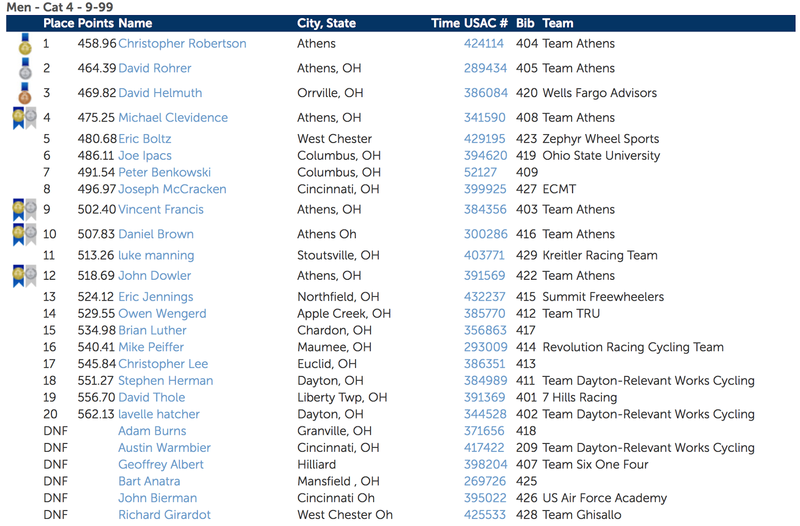 I typically don't start the Sandbagging callouts until cross season, but sometimes you just have to do it. 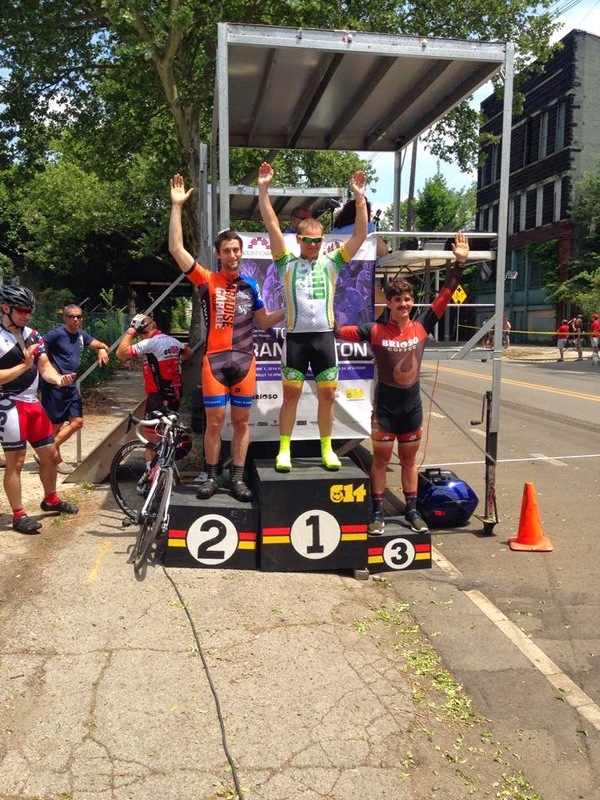 I had nothing to do on Sunday so I decided to head down to the Franklinton crit. When figuring out what time to head down there, I saw Mr. Aidan Seufert registered for the Cat 5 race! Wait, isn't he like a 2 or 3 in cross? Mr. Red Hook Crit? This motivated me to wake up early to make it in time for the Cat 5 race. I rolled down to the race with plenty of time to drink a beer and see the start of the race. Every lap, I would see Mr. Seufert 2nd, 3rd, 4th wheel, but never up front doing any work. Typical sandbagger tactics. Needless to say, what I figured would happen, happened. Mr. Seufert easily took a win and did it in douchbaggery fashion by sprinting as hard as he could with no one behind him. Mr. Seufert, you really need to look up when you sprint. Otherwise you'll run into the back of someone who is much faster than you and its gonna be a bad time. And here is the glorious podium shot! 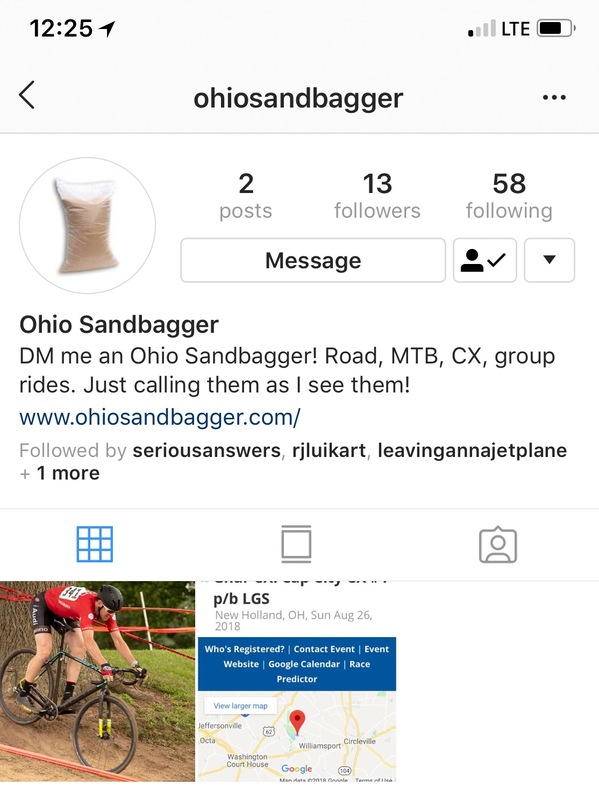 So after the Cat 5 race, word on the street was Mr. Seufert was completely satisfied with his stealing-candy-from-a-baby sandbagged cat 5 race and didn't want to race again. Only with an investor paying his way into the 4/5 race, was he convinced to toe the line again. The 4/5 race was much of the same, sitting in the top 2-6 positions. Note how I said 2-6, not top 6 since I didn't see him see the wind at all in the race. Witnessed some sketchy dive bombing and wheel chopping on Josh Direen, his Columbus rival, but Mr. Seufert couldn't hold him off. In fact, a new face in the race scene from Athens, took the top step of the podium. Well there you have it. 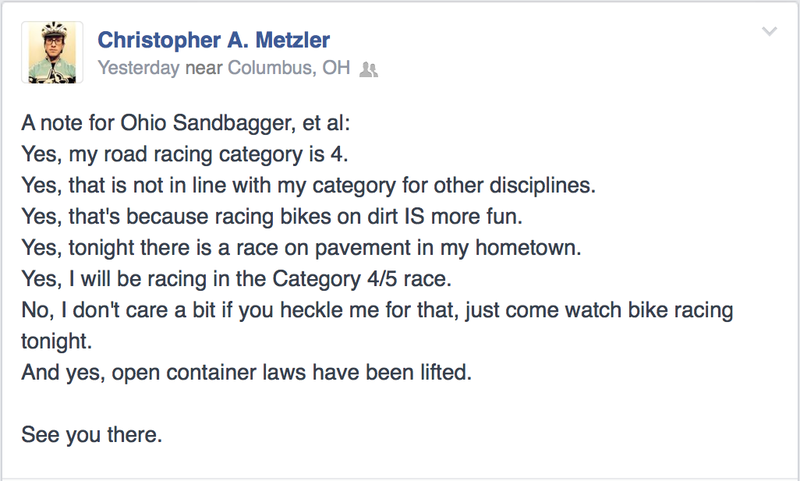 The first installment of Ohio Sandbagger 2014. There will be more to come!